Businesses are growing tremendously and the use of technology in almost everything has brought many changes and advancements in it. 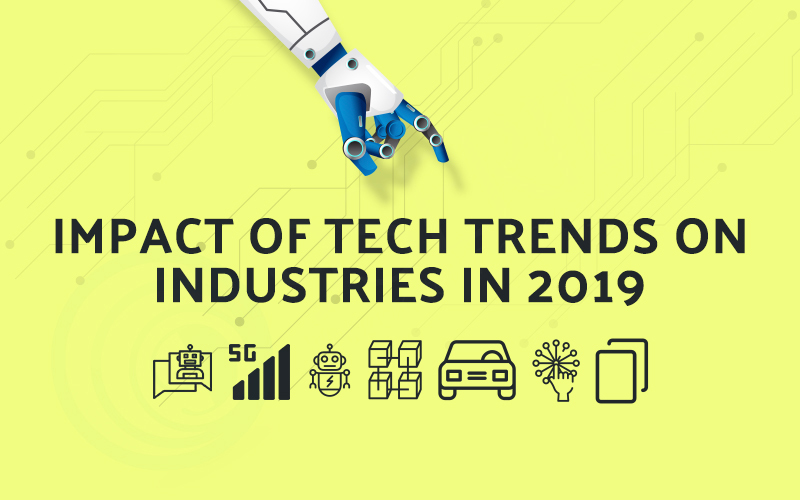 People are expecting the next generation technologies 2019 to reshape the future of Industries. Technology is pivotal in every business today, be it e-commerce, banking, retail, manufacturing, healthcare, education, or any other it can be seen everywhere. Let’s take a closer look at how trends will be changing and what possible impacts it might have in 2019 and the coming years. There is an increased demand for customer support across various industries. You will see a drastic transformation in the way the service industries work with the help of Natural Language Processing. With the advanced technology of Chatbots, companies will be able to provide unique customer services that will make them tough competitors in the market. Advanced chatbots can very easily detect the emotions of the users, mimic human beings and provide correct information based on the user behaviours. This will turn out to be very advantageous to e-commerce, manufacturing, entertainment, and more industries as they work entirely on their user’s behaviour and choices. 4G will soon be old news. Today, people will want everything fast and speedy, & they are expecting the 5G mobile wireless network to launch soon. There lie many opportunities with the launch of this new mobile network technology. The battery power consumption will be much lower compared to that of 4G. It will also provide super fast communication for interconnected devices, faster integration of intelligent apps with other ecosystems leveraging the Telecommunication industry the most. There are already many of them who have announced 5G to be launched by mid-2019 or end of 2019. Let’s wait and watch! Demand for data security has increased. In 2019 we will witness the technocrats focusing more on cybersecurity and keeping up with it with the help ML & AI. Machine Learning & Artificial Intelligence is used to predict & protect the data from being hacked. Over the year these two technologies will improvise providing you with a much quicker and less expensive response to the adversary attacks. With the enhancement in cybersecurity, the chances for cyber attacks will also increase. Where there is more security, chances of attacks are even more. Almost all industries will have the fear of cyber attack and hence having an upgraded Cybersecurity will become utmost important. Blockchain has been the centre of all talks and captured the tech market attention in 2018. More importantly for the developers, as they saw it as a key to the user problems on managing their authentication. We all have been aware of the transformations Blockchain has brought in the currency world. It has and will remain a successful platform for dealing with cryptocurrency. It has also provided a secure environment to the finance dealers. It has positively impacted the insurance sector too and is bound to remain a hot trend in 2019 for the mobile app developers. So yes, we are hoping to see a lot of new developments with Blockchain. You will soon see it being adopted by mobile app developers for payment gateways and online transactions, but that is something we might still have to wait for. Be it cars, robots or other autonomous things they use AI to complete their tasks that are usually done by humans. The sophistication might vary but all autonomous things work on AI for natural interactions. You will see a lot of tools & apps that will ease the work of consumers & business owners by automating the daily tasks especially the time-consuming ones. Augmented Reality (AR) hit the market in 2018 itself, but in 2019 you will see an increase in the number of mobile devices it will be supporting. There will be a continuous growth of AR/VR in 2019 too as it will be seen in apps that will be used for various other things. You will also see a transformation in app development as it will be used in sectors like health, real estate, retail and many more. Some have already incorporated it, you will see more advancements by the end of the year. Digital twin basically is a replication of the objects, system or a process. It can be a digital representation of any aspect of a real identity like human beings. Companies have already started adopting it. According to a survey 48% of companies in the IoT have already adopted Digital Twins for their business for complex entities, such as a Smart City like Digital Singapore. It will also have a positive impact on the healthcare & commercial real-estate industry. 2019 has just begun, you will see more advancements in the technology and the use of it. The increasing demand will bring a lot of changes to it. As a top next-generation technology development services provider, you must look forward to the exciting changes and advancements in it. You must be ready to welcome these changes and enhance your skills if you wish to hold success this year.